One night, the three men smoke together in J. 's London apartment, discussing their anxiety over their sicknesses. The reader can discern that they are actually hypochondriacs. After researching diseases at the British Museum, J. has recently concluded that he suffers from every disease known to man except for housemaid’s knee. 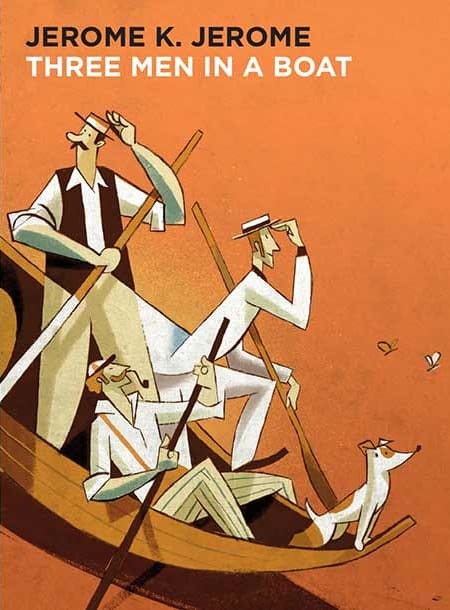 The men decide that a vacation will be good for their health, and after some deliberating, they decide to spend a week rowing up the Thames with their dog, Montmorency. The men make arrangements for the trip. They decide to bring a cover for the boat so they can sleep in it, rather than bringing a tent or staying in inns. They compile a long list of items to bring, but quickly realize that they should only pack the essentials. Although they are friends, J. seems to dislike Harris, and compares him at length to J.’s incompetent Uncle Podger. They end up bringing a hamper of food, clothing, a cover for the boat, and a methylated spirit stove for cooking. Packing takes a long time because the men keep forgetting items they need, and prove somewhat ill-fit for the the task. The men oversleep on the morning they are supposed to leave, and have trouble determining which train to board for Kingston, from which they intend to embark. They eventually make it, though, and begin the journey. J. describes some local landmarks, including Hampton Court and some pubs that Queen Elizabeth dined in. Harris tells a story about getting lost in the hedge maze at Hampton Court. The men pass through their first lock – that is, a section of the river where the levels are lowered or raised between gates, to regulate traffic and water flow. J. comments on how irritating it is when women wear ‘boating clothes’ that are too delicate to get wet. George separates from the group to do some work for his employer in Shepperton. Harris proposes visiting a cemetery to see an interesting tombstone, but J. rejects this idea, finding cemeteries depressing. Harris falls into the food hamper while trying to get some whiskey.